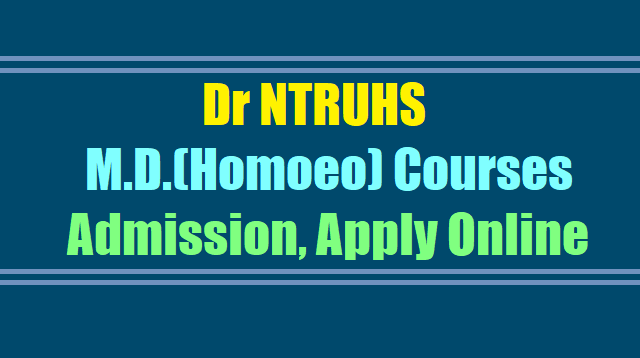 Dr NTRUHS MD(Homoeo) Courses admissions 2018, Apply online, Dr NTRUHSnotification for Admission into M.D. (Homoeo) courses: Dr NTR University of Health Science has given MD(Homeo) Courses Admissions notification for Admission into M.D. (Homoeo) courses available in the State of Andhra Pradesh under Dr. NTRUHS for the academic year 2018-2018. Application forms through online are hereby invited from the eligible candidates for admission into M.D. (Homoeo) courses through Computer based (online) Entrance Test for the academic year 2018-2019 in Dr. Gururaju Govt. Homeopathic College, Gudivada and for new colleges likely to be permitted, in the State of Andhra Pradesh and affiliated to Dr. NTR University of Health Sciences, Vijayawada. The eligible candidate who desires for admission into M.D. (Homoeo) Courses shall apply through online on the Website http://ntruhs.ap.nic.in from 08.10.2018 to 05.00 PM on 14.10.2018 upto 5.00 PM only. The online application can be filled through any computer with internet connection (home/internet café/net center). Dr NTRUHS Notification for inviting applications for Admission into MD (Homoeo) Course 2018 available under Dr. NTR UHS, Vijayawada. Application forms from the candidates whose names figured in the merit list of AIAPGET - 2018, and fulfilled the eligibility criteria for admission into MD (Homoeo) Course - 2018 under Dr. NTR UHS, Vijayawada, are invited through online from 11.00 AM on 08.10.2018 to 05.00 PM on 14.10.2018. 1. Total marks acquired in the qualifying examination i.e., BHMS (1st to Final year put together) will be considered. for determining the State merit position. 3. In case of equality of all the above criteria, then date of birth will be considered for determining the State merit position. 1. The PG Courses leading to Doctor of Medicine in Homoeo are open to the holders of BHMS Degree of Dr. NTR University of Health Sciences and holders of Degree of any other University/Statutory body included in the 2nd schedule to the IMCC Act, 1970. 2. The candidate should have completed training as internee/House Officer by 30.09.2018. 3. For in-service candidates, the three years of regular service shall be calculated as on 30.09.2018. 4. Candidates who were already admitted and studying MD (Homoeo) Course shall not be permitted for admission into M.D (Homoeo) unless they discontinue the course by remitting the bond amount and the stipend taken upto that date before submitting application form and such candidates shall submit the discontinuance certificate issued by the Head of the Institution alongwith the application. 5. Candidates who are already holding a Post Graduate Degree in Homoeo in a subject shall not be eligible to admission into MD (Homoeo) course. 2 .The qualified and eligible candidates as per concerned regulations who desire to take admission to MD (Homoeo) Course shall apply through online (Website http://pgayush.apntruhs.in) from 11.00 AM on 11.10.2018 to 05.00 PM on 17.10.2018 only. The online application can be filled through any computer with internet connection (home/internet café/net center). The printout of filled-in application along with enclosures in three (3) sets should submit at the time of verification of original certificates / counseling as per the schedule that will be notified by the University separately. 3. Registration Fee:- Rs. 3000/- + Bank charges for OC/BC & Rs. 2700/- + Bank charges for SC/ST candidates to be paid through online. 4. Verification Fee: The candidates who studied BHMS course outside the state of Andhra Pradesh / Telangana are required to pay an extra fee of Rs.3000/- towards Degree Verification fee in addition to the above registration fee. 6. The candidates are advised to download and read the (1) Prospectus of the course (2) Instructions for filling Online Application available in the website before filling the online Application. (d) Study Certificate(s) from 1st year BHMS to final year BHMS. (e) In case of candidates obtained BHMS or equivalent Degree from outside the State of Andhra Pra desh and Telangana / India, 10 years residence certificate of father / mother /spouse issued by Competent Authority indicating years of residence and other relevant certificates if any as per Presidential order in support of eligibility. (f) All marks memos from 1st year to final year BHMS course. (k) Differently abled (PH) certificate if applicable. (PH quota reservation will be followed if sufficient number of seats available). 5. Visit website through Internet Explorer (7.0 to 11.0) or Mozilla Firefox (14 to 31) or Google Chrome (20 to 36) to fill the application form. 6. Fill all the details in the Online application form. 8. Procedure for submission of filled-in online Application form for MD (Ayurveda) course: At the time of verification of certificates, the candidate should submit the print-out of the filled-in Online application form along with all required certificates in three (3) sets, as per the schedule to be notified by the University. 1. Application forms submitted at the time of verification of original certificates/ counseling without copies of the required Certificates, Passport size photo, without signature at declaration area, incomplete applications will stand automatically be rejected and will not be considered. 2. Candidates admission is strictly provisional. The mere fact that the Merit position issued to him/her does not imply that his/her candidature is accepted by the University and it does not mean that the entries made by him/her in the online application are accepted as true and correct. He/she may please note that the University will take up the verification of original certificates with regard to eligibility conditions i.e., educational qualifications, validity of registration with State Council concerned Internship, local/non local area status after duly verifying all the relevant certificates in original at the time of verification of original certificates/ counseling. If the information furnished by him/her in the application is incorrect, his/her candidature is liable to be cancelled and further action that deems fit will be taken. 3. Mere submission of application through Online is not sufficient. Candidates eligibility for admission to MD (Homoeo) course 2018, session will be examined by the University only after submission of printout of application (hard copy) alongwith all enclosures specified. 4. The Orders issued from time to time by Government(s) with regard to Admissions to MD (Homoeo) Course will automatically be applicable. 5. The schedule for counseling / verification of original certificates and for allotments of seats into MD (Homoeo) course will be notified separately. 6. An in-eligible candidate obtaining Merit position does not make him/her eligible for admission. 7. Admission will be only for candidates, whose names are figured in the merit list of AIAPGET - 2018 and State merit list. · for technical difficulties Nos. 09490332169, 09030732880.